Trócaire warns that Ireland is one of only four EU member states not on track to meet EU 2020 commitments on CO2 reduction. Climate march Dublin, 30th November 2015. As negotiators from 195 countries continued their talks towards reaching a deal aimed at reducing global carbon emissions, the executive director of Trócaire said Ireland must prioritise meeting the EU-wide 2020 target to reduce emissions by 20%. On Monday 31 November, Taoiseach Enda Kenny addressed the UN Climate Summit in Paris. “Ireland’s national long-term vision is presented in climate legislation, which sets out our intention to substantially cut CO2 emissions by 2050, while developing an approach towards carbon neutrality in the land sector that does not compromise our capacity for food production,” he said. But talking to reporters, the Taoiseach said the targets set by the EU Commission for 2020, which called for a 20% reduction of emissions compared with 2005 levels were “unrealistic” and “unreachable”. “This policy vacuum has meant that key policies for economic recovery have been developed in the absence of any real consideration of our climate emissions. This situation must now be reversed,” said the executive director of Trócaire. Mr Meehan welcomed the passage of the Climate Act into law in Ireland, but was critical of the 18-month time frame outlined for the production of the first national mitigation plan. 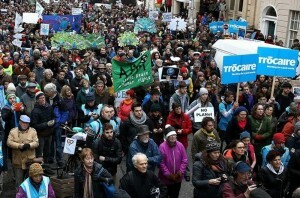 Last Sunday over 785,000 people from every corner of the world took to the streets to ask governments to take action on climate change as world leaders gathered in Paris for the 21st UN Conference of Parties Summit, which will decide on binding measures to curb greenhouse gases. The talks run until 11 December. In Dublin over 5,000 people marched while smaller marches took place in Belfast, Cork, Naas and Galway. 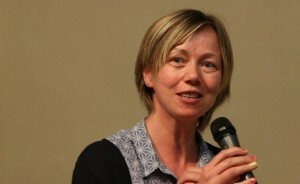 “The atmosphere at the Dublin March was one of solidarity,” Lorna Gold policy analyst with Trócaire told CatholicIreland.net. Dr Gold said she felt that the “germ of a movement that will not stop” was born with Sunday’s marches. Trócaire is running an on line petition addressed to An Taoiseach Enda Kenny, saying his comments that “climate change is not a priority” for Ireland are “offensive and irresponsible” and calling on him to “set ambitious targets to reduce carbon emissions”.